"But I'm not happy," Di announced. "I didn't get invited to the spring dance. I even wrote to Miss Lonelyheart about it"
Mart gasped. "Jeepers!" he exclaimed. "So you did! Consider yourself invited now. By me!" Brian grinned at Honey. "How about it?" he said. "Will you be my date on Friday night?" Jim smiled as his sister nodded shyly. "In that case, Dan," he said slowly, "that leaves only one female between the two of us." Dan chuckled. "But I'm already booked," he said. "I'm taking Ruthie Kettner. I guess you're going to have to take Trixie yourself." Jim smiled and leaned toward her. "What do you say, Trix? Will you come to the school dance with me?" His tone was light, but everyone could see that his eyes watched her closely. Trixie's face flushed scarlet as she answered happily, "I'll be glad to go with you, Jim - unless another mystery comes along that I have to solve first." The other Bob-Whites groaned in unison. "Please - no more mysteries!" moaned Mart. "At least, not until after the spring dance," added Jim. He smiled at Trixie, and she smiled back, her eyes shining. There would be more mysteries, she knew, but for now, the spring dance was enough to look forward to. 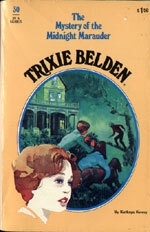 The ghost writer of this book is thought to be Joan Chase Bowden. 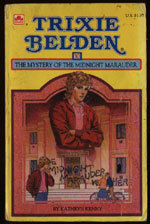 Mart Belden is behaving mysteriously and when the school is broken into by a mysterious Midnight Marauder, he becomes the prime suspect. Trixie and the Bob-Whites have their hands full solving the mystery of Mart's behavior, the disappearance of Reddy and Patch and uncovering the true identity of the Midnight Marauder before any more damage is done. It is March and Peter, Helen and Bobby have gone to Albany for a day to visit friends. A string of incidents (storm and a wrenched back) keep them from appearing in this book except for over the phone. The school newspaper is called the Campus Clarion and is six pages long (p. 39-40). Mart later reveals that he writes the Miss Lonelyheart column. 'Once, during one of the Bob-White's early adventures, Trixie had pretended to like Ben a lot, even though everyone knew she liked Jim best. Trixie could feel her face growing hot just thinking about it' (p. 47-48). Maybe it was all that time spent away on endless summer vacations? Sergeant Molinson is christened Wendell in an article in the Sleepyside Sun (p. 153).